Some online casinos give so many different types of casino bonuses that it can be hard to keep track of them and use them before they expire. Jackpot Capital Casino is one of the most generous online casinos, as far as bonuses go, and they've just launched a cool new tool to manage them. Their exclusive new coupon organizer, My Coupons, gathers all applicable coupons in one place. Players can now easily view all coupons available exclusively to them and choose which to redeem. Since the casino is giving away $100,000 in Holiday Surprise gift bonuses this holiday season the new feature couldn’t have come at a better time! 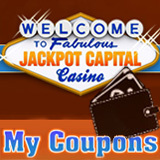 With daily Holiday Surprises through December, there are more bonuses to keep track of than ever at JackpotCapital.eu. The Holiday Surprises promotion will give away $100,000 in casino bonuses, all wrapped in festive packages under the Jackpot Capital Christmas tree. Just by playing casino games players earn points that determine which gifts they can unwrap. Players that earn all 10 gifts advance to the Finalists’ Scoreboard where they’re guaranteed to win a free cash bonus prize after the completion of the promotion on 15th January 2012. There are three scoreboards so players at every level have a chance to win. Details available at http://promotions.jackpotcapital.eu/holiday_surprise. JackpotCapital.eu offers more than 300 casino games and is home to some of the biggest progressive jackpots available online. The total jackpot pool is over $6.2 million and the Jackpot Piñatas jackpot alone is over $1.7 million. The Aztec’s Millions jackpot and the jackpot tied to both the Mid-Life Crisis and Shopping Spree slots are also both well over $1 million.